Today's FCC Media Bureau decision against Prometheus, et al upholds current policy in regards to filing Petitions for Reconsideration. Even though anyone can file an Informal Objection, there are specific requirements for "standing" in a Petition for Reconsideration. In a Petition for Reconsideration, you must be able to demonstrate that the individual or the organization would be personally harmed by the grant of the application for which reconsideration is being sought for. Just based on geographic location alone, a large majority of these applications are not in the communities where the signatories of the Petition for Reconsideration is located. Is they are not listeners to those stations or their competitors, there is no way they can be harmed by the outcome. In the single case that the Media Bureau kept active was against FM translator W293DS, a translator in the Philadelphia area for WEMG, Camden NJ. In this specific case, Paul Bame of Prometheus was able to identify that he is a listener of WPPM-LP, Philadelphia and as that the grant of this translator resulted in the §73.807 short-spacing to WPPM-LP thus limiting WPPM-LP's ability to move. The next move for the remaining translator applications (where the Petition for Reconsideration was denied) is that Prometheus et al can file an Application for Review which can be reviewed by the full Federal Communications Comission. The objectors would have an uphill battle because they would have to demonstrate how the Media Bureau errored in denying their Informal Objections and Petitions for Reconsdieration. REC's position is that Prometheus et al should not continue with the process. Various requests made by Prometheus et al in their Petition for Reconsideration are being addressed by REC in RM-11810 including the ability to use contours instead of distance separation in respect to LPFM stations protecting FM translators as well as increased effective radiated power for LPFM stations. REC's position remains that if there was an issue with how the translator filing windows were going to be conducted, it should have been brought up as a Petition for Reconsideration in the AM Revitalization rulemaking proceeding. This did not happen at the time. If reconsideration was requested a few years ago when the first Report and Order was released, it is very possible that W293DS would have not been granted since the proposed translator does preclude LPFM channel points if the FCC was to require a anti-preclusion studies similar to what was done in 2012 to the Auction 83 translators. 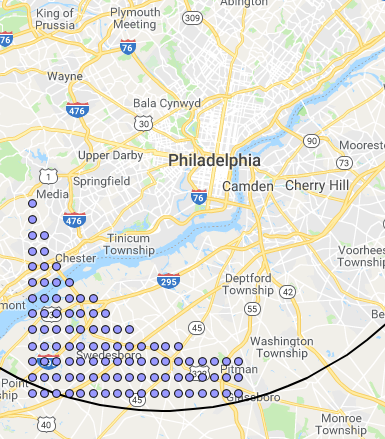 Protected channel points within 39 km of W239DS if the FCC was to implement 2012-style channel point protection for Auctions 99 and 100 in respect to the Philadelphia (spectrum limited) and Wilmington (spectrum limited) 30x30 minute channel-point grids. (does not reflect current rules or policies). Since the FCC never enacted a channel point anti-preclusion requirement for the Auctions 99 and 100 windows (the limited number of applications that could be filed in the window and the community need addressed by revitalizing mom-and-pop AM stations that have been suffering from interference for decades), Auction 99 and 100 translators are not required to protect LPFM opportunity channel points. A better way is currently on the table.